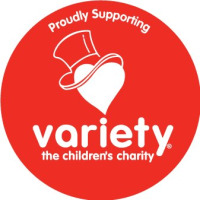 Variety- The Children’s Charity believes all Aussie kids deserve a fair go no matter what their ability or circumstance, and exists to help kids who face challenges with disability, chronic illness or financial hardship. Last year alone, Variety directly impacted the lives of 108,107 children through the delivery of $11,180,504 in grants for necessary equipment such as mobility devices, communication and education aides, medical items and therapy services. These tools make an immeasurable difference to the life of a disadvantaged child.